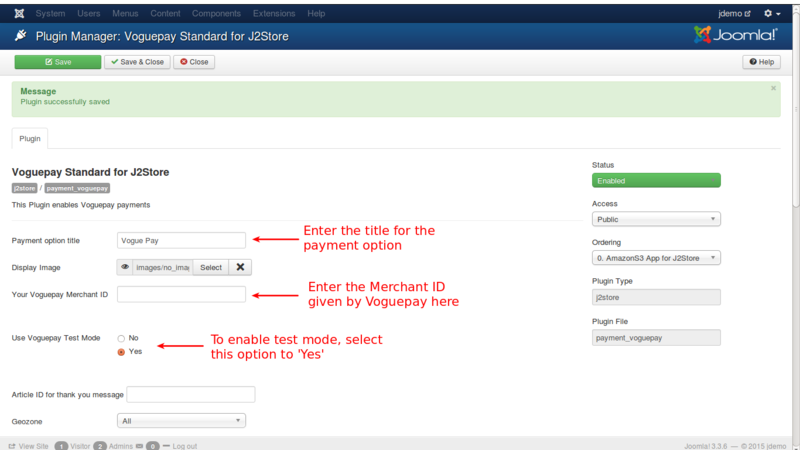 The Voguepay Plugin for J2Store enables you to receive payments via Voguepay Payment Gateway. This integrates the Voguepay's Website Standard Payment API. In the backend, go to Extensions->Plugin Manager and open the Voguepay Payments plugin. (type=j2store). Now you can see the Voguepay Payments as an option during the Check out process. After Successfull login you will get Merchant ID ( Parameter: Voguepay Merchant ID).Use Voguepay Test ModeVoguepay offers a test environment. Before going live, you can test your store using the Voguepay's test environment.By setting this Test mode ON , your merchand ID will be set as demo. You can create an article to say thanks, provide some information or instructions to the customers, who purchased in your online store. Enter the Article ID here. This will show, when customers return from the Voguepay. By selecting a geozone here, you can restrict this payment method to only customers of that geo-region. Choose All geozones to show this method to all customers.Logo Image for display in VoguepayThe URL of the 150x50-pixel image displayed as your logo in the upper left corner of Voguepay’s pages. Default: your business name (if you have a Business account) or your email address (if you have Premier account). If this is not working, try using the Custom Header Image param above.This is an optional setting. The text entered here will be displayed when customer selects this payment method. You can enter a language constant as a value here if you are using a multi-lingual site and then write a language override. Refer the tips belowTip - ONLY FOR MULTI-LINGUAL SITESFor example, enter a language constant:J2STORE_TEXT_TO_DISPLAY_ON_SELECTION. The text entered here will be displayed to the customer when he cancels the payment at the gateway (NOT in your site).You can enter a language constant as a value here if you are using a multi-lingual site and then write a language override. Refer the Display text on selection parameter.Payment Button TextThe text of the payment button. The button will be displayed at the final checkout step. Set Yes to enable to debugging. NEVER AND EVER set this in Live site. This is Screen shot Will help you to Enable Test Mode, To test Your Store before going live.